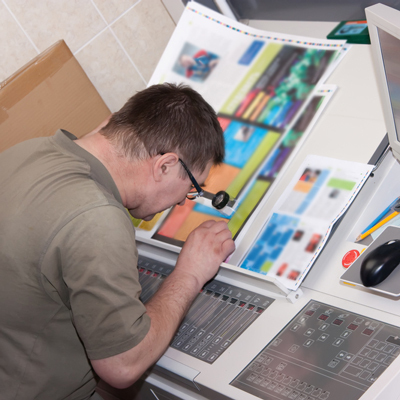 We have many years experience in accurately producing corporate print and achieving the best possible results. We take great care to print to your specifications and colours; and use the highest available materials offered. We have many clients that can verify that we have produced accurate and outstanding quality print for them. We mix all spot Pantone colours on a job by job basis and match them to Pantone colour guides. On uncoated stocks, (letterheads, compliment slips, Conqueror stock, White Invitation ivory board, Pads etc), we will match your spot colours to the Uncoated Pantone Guide. On coated stocks (Silk and Gloss stocks), we will match your spot colours to the Coated Pantone Guide. NOTE : The ink mix for a Pantone colour is identical for coated and uncoated stocks; But the colour will look different depending on which substrate it is printed on. We print Full colour work (CMYK) to internationally recognised ink weights on all types of stock. It should be pointed out that what your own colour ink jet / laser printer produces, or what your artwork looks like on screen, will not necessarily match our accurate printing processes. Also, that print on uncoated stocks (most stationery and Conqueror stocks), will print differently to if it is printed on Gloss or Silk stocks. Gloss & Matt Lamination will also change the colour of the print compared to how it looked before we laminate. (The correct Pantone colours, or in the case of full colour printing, correct ink weight strengths, will always be printed on the base stock). In the rare event of us not printing colours accurately, we require that you return the printed job back to our factory in Hersham, Surrey, just outside London, in full, that was delivered to you. We will then check and confirm that your complaint is justified*, and where agreed, we will reprint and deliver back to you at no additional cost. We want you to always be happy with the print we produce. We rely on repeat business and referrals, and in order to achieve this, we aim to produce to the utmost in achievable quality and highest standards and service in print. * In the event of a complaint, but where we think we have produced your print accurately to accepted standards, and to your instructions, we will discuss your concerns with you and if needed, get a second opinion from the BPIF (British Printing Industries Federation) whose opinion either way we will respect. Our full Terms & Conditions apply.